We know that Ducati isn’t afraid to try something new. It’s also apparent that the Italian maker isn’t afraid to try something old. 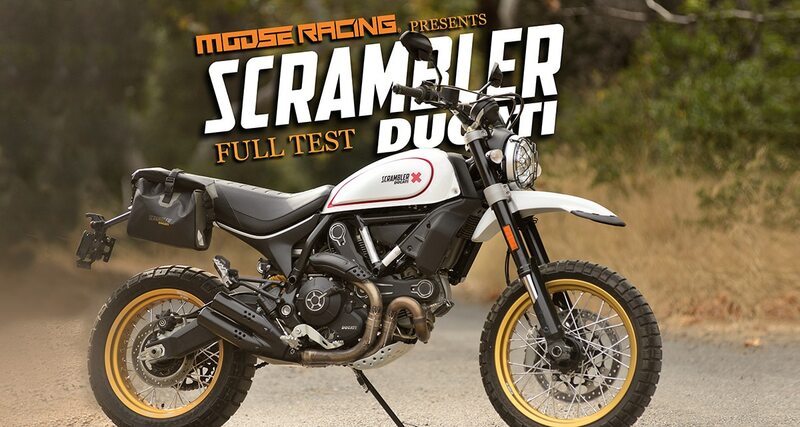 The Scrambler line demonstrated that when it was launched three years ago. These are image-driven naked bikes with a dirty edge, and they’ve struck a chord with young urban riders who are looking for something to be a part of. Ducati looked to the ’60s to come up with the Scrambler look; it was based on the company’s 250cc four-stroke that was produced between 1962 and 1974. The next chapter in Ducati’s play book is to expand the Scrambler image beyond the company’s own history and link it to a larger movement in the motorcycle world. That’s why the Scrambler Desert Sled is here. Back in the late ’60s, “desert sled” was a generic term, but it was usually associated with a Triumph TR6 Trophy. There were Bonnevilles, Tigers and even a few bikes like Honda CB450s that riders called desert sleds. It was more of an image than an exact motorcycle model. Now, Ducati is either paying homage to that image or hijacking it, depending on how cynical you want to be. The Scrambler Ducati Desert Sled pays respect to the Bud Ekins/Steve McQueen era of motorcycling. The price in this trim is $11,895. 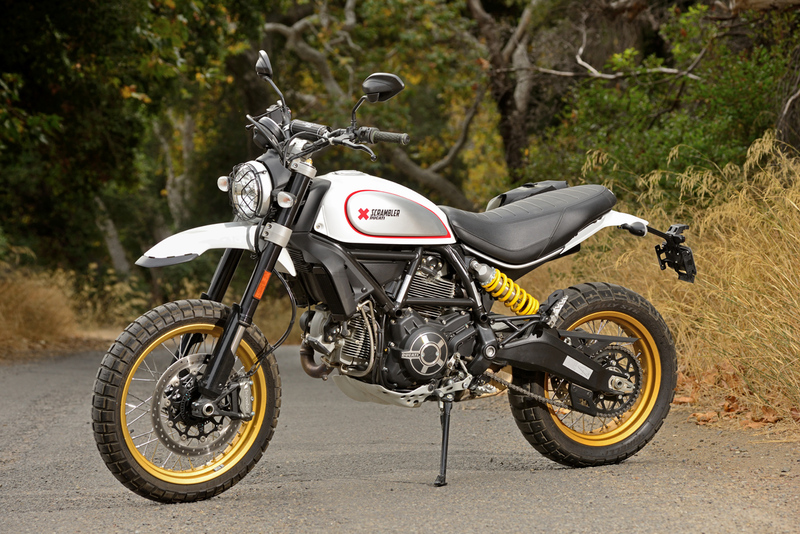 Marketing aside, the Scrambler Ducati Desert Sled is best described as an adventure stripper. If you take an adventure bike, remove the fairing, luggage and some of the fuel capacity, you have a smaller, lighter bike that’s less intimidating in the dirt. Think of it as a new mission statement; instead of week-long adventures, you have daytime excursions. 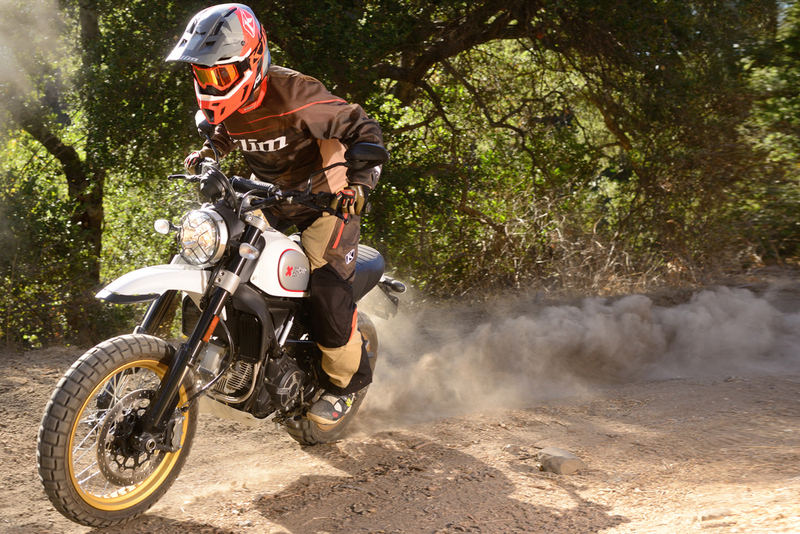 The Desert Sled model takes the dirt part of the mission more seriously than the original did. It got a reinforced frame, a longer swingarm, longer suspension travel, spoked wheels and Pirelli Scorpion Rally tires. There’s a small skid plate and a wide handlebar. You can even get a retro handlebar pad as an option. One of the cool things about the Scrambler is that all the technology is out there in the open to be seen. This is the same 803cc L-twin motor that Ducati uses in the original Scrambler, which is rated at 73 horsepower. The design has two valves per cylinder and is air-cooled, although it’s still very sophisticated with the Desmo valve train that Ducati is known for. The bike comes standard with anti-lock brakes, although this can be disabled for dirt use via a mode switch on the handlebar. It stays disabled when the bike is restarted, and it reminds you of that fact with a flashing ABS icon. The Scrambler doesn’t have the large instrument display and rolling electronic entertainment center that most adventure guys are used to. It’s stripped clean and just has a single round display with an analog speedometer. All kinds of information can be had there if you look closely enough, but you have to have good eyes. The Desert Sled is no MX bike, but you can get away with more than you might expect. No matter what you might expect out of the Desert Sled, it’s something else. The bike is a blast to ride off-road, but it can’t quite be compared to anything currently on the market. First of all, the bike has a retro layout, in a good way. It has a very roomy, upright riding position and a flat, comfortable seat. The handlebar is wider than anything built since the ’70s. What really makes it feel different from any other 800cc motorcycle that you might take off-road is that it feels small. A Multistrada or a full-size BMW will make you feel like you’re the captain of a supertanker. The Desert Sled is a dinghy. Despite having additional travel compared to the standard Scrambler, the Desert Sled still has a fairly low seat height. It’s also about visual cues. You don’t have a windscreen or anything in front of you—just the bars and the road. 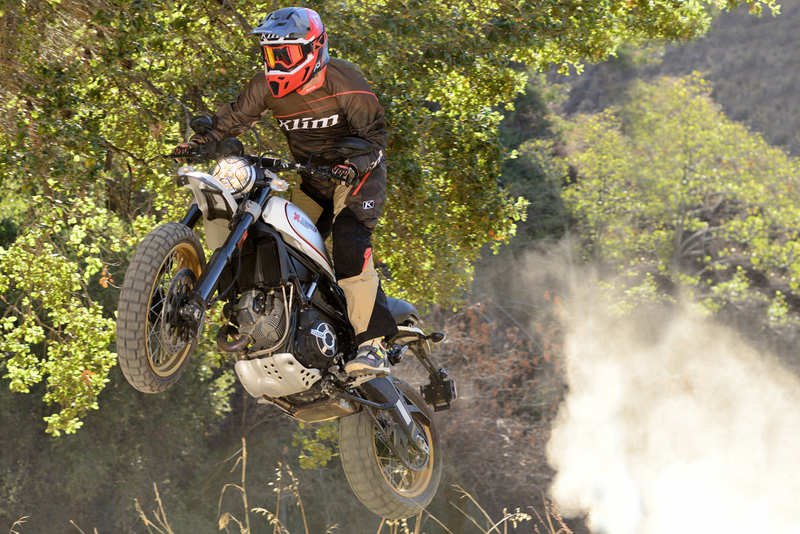 What makes the Scrambler really feel so unusual is how that compact nature mixes with a whole bunch of power. The 73-horsepower rating does not do this bike justice. It has incredible torque. The feeling of power is all about what happens when you first open the throttle, and the Sled is super crisp down low. Then it revs to around 10,000 rpm. Put that on a dirt road and it’s a wild ride. The leverage you get from the wide handlebar is quite functional with such a wide contact patch from the 19-inch front tire. How hard should you ride the Sled in the dirt? It encourages you to go fast, but you have to let common sense take over at some point. It’s still a 456-pound motorcycle, according to Ducati’s wet-weight figures. The bike feels so light, it encourages you to let it fly across rough terrain, but the laws of physics can spoil the fun. Treat it with the respect due of an 800. The original Scrambler used the engine as a stressed member of the frame, which caused problems when riders got carried away in the dirt. The Desert Sled has an additional frame member, stiffer triple clamps and a lot of gusseting to deal with this, but the KYB suspension still only has 8 inches of travel, and it’s stressed very heavily by its no-linkage connection to the swingarm. It can bottom hard. Back your enthusiasm off a notch and you’ll be fine. Slide and ride, Ducati style. We get it. Most of the Desert Sled’s duties will be short rides to and from work or around campus. The weekend excursion is the goal, not the rule. The bike is excellent for the short commute for all the same reasons that it’s fun off-road. It’s agile in traffic and narrow for splitting lanes (where that’s allowed). The motor is smooth but not electric. It still has a pleasant pulse. For street rides, its shortcomings are typical of a naked bike. The engine can radiate an uncomfortable amount of heat on a summer day, and it’s hard to carry much luggage. Ducati has a huge line of accessories, including various soft bags to deal with that. Whether you take the Desert Sled off-road or not, Ducati did a good job of capturing a compelling image. We know that most of the bike’s target riders have no real connection to the original Scrambler or the desert sleds of the ’60s. They weren’t born yet. Still, of all the retro trends that have come and gone, this is one that we can wholeheartedly get behind. The Scrambler is an excellent tribute.